Best show ever!!! Renew, renew!!!! Always better to go out on top rather than dying a slow painful death. TNT has made fool moves for the last few seasons. And the only reason for Nielsen dropoff was the time slot change to Wednesdays to kill the show and justify its fool decision. Sure will miss Major Crimes, one of the best series I have ever seen and hope another network picks it up, still think there is a good future for this great crime series. We should all boycott them ending Major Crimes. I love watching it and looked forward to it’s return. This other crap that TNT is bringing on I will not be watching. Execellent cast and all will be missed. They get rid of the good shows and bring other crap on that no one is interested in seeing. Thank you Major Crimes for 5 seasons. I challenge others to let their voices be heard and maybe they will bring it back on TNT or another network? There’s an upcoming season that’s going to be the final season. Oh, come on! The creator, the director, and the stars all say the same! Another stellar show down the tubes. Why? What? Who? I’ll never figure it out! I knew they were going to kill it a month or two back their website was obvious they were not even promoting repeats it was hard to find their page the marketing just wasn’t there marketing , branding a show can and often does shore up ratings . TNT and USA have made questionable decisions on terminating the good shows and promoting the ones that target a narrower demographic audience . Major Crimes targeted the right demographics did no leg work in marketing . I have been in and worked on Indies that had better marketing . 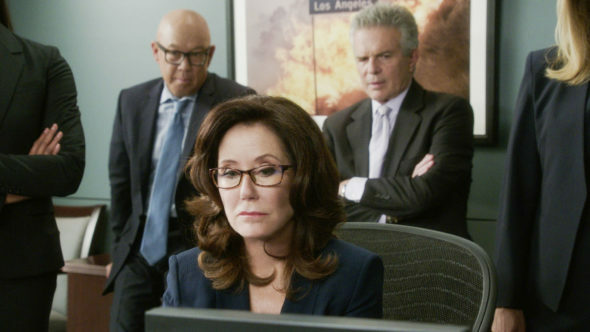 I will truly miss Major Crimes, one of the best shows on TNT and any other network..I have watched it when it was the Closer and continued to watch it when it became Major Crimes..this is a huge mistake to take it off the air and I know I am not the only one that feels this way. Shame on TNT. This is such BS. Fans are already on a mission to save the show. In less than 12 hours have gathered over 1100 signatures to try to get another network or streaming platform to pick it up. The second highest watched show and over 10 million viewers is not ready to be cancelled. After 13 years, it still performs better than ANY of Reilly’s Pet Projects. As a business woman, I have never wished bad for any business, but will LMAO when TNT allows Reilly to take it down in flames. Petitions never work – these pittly fan efforts in the thousands won’t save a show that has millions of viewers.